In an attempt to make use of some past occurrences, when organizing a wide societal response to climatic change, we should also accumulate maximum information about the latter. What is known up to now is this (put very briefly): If the emission of greenhouse gases remains constant at the 1985 level, carbon dioxide concentration would reach about 440 parts per million by volume (ppmv) by the year 2100, as compared with the 350 ppmv of today and 290 ppmv a century ago (US EPA, 1989). The doubling of C02 would contribute to an increase of the global average temperature by some 2 to 3.8°C. Because of a number of uncertainties as to the intensity of future emissions and several natural feedbacks occurring in the biosphere, the expected average warming would lie within the range of 1.2 to 5.5°C (US EPA, 1989). Furthermore, "The temperature increase would not be distributed uniformly among regions: if there is a 2°C warming near the equator there might be a 6-10°C warming (annual average) near the poles" (Glantz & Ausubel, 1988, p. 120). The latter occurrence alone would have serious consequences. Oceanic circulation is mainly wind-driven - if the meridional gradient of air temperature drops, the oceanic circulation might become less intensive. The horizontal motion of water masses could be disturbed, deviating from its usual direction or changing the geographical range. This would also lead to less vertical mixing of water. Some coastal upwellings may become weaker or may shift, re-emerging in other places. In consequence, the distribution and intensity of the inflow of nutrients to the surface could change. Nutrients constitute the critical component of oceanic productivity and are particularly scarce at lower latitudes. The boundaries of some ecosystems could expand or shrink and this may lead to the genetic mixing of some populations. Warmer water could pass beyond the thermal tolerance of some finfish or shellfish. By changing the temperature or other properties of the ecosystem, some species may vanish from a niche and others may enter that ecological niche (Glantz & Feingold, 1990). In general, one may assume that global warming may shift fisheries productivity northwards in the Northern Hemisphere and southwards in the Southern one. It is most likely that governments will react in two (conflicting) ways in response to the change in distribution of living resources in the world's oceans. In particular, some fishery administrators would be very keen to learn, first, whether the fishermen in their countries will gain or lose something as a result of the shift of fish stocks before they initiate any action in response to the global warming. Others will hold views that a premature division between those who gain and those who lose will do nothing but inhibit the internationally consolidated effort in combating the increasing C02 emission. For example, as Glantz states: "This perception about potential benefits as well as adversities associated with the yet-to-be-identified regional impact of a global warming will clearly serve to constrain international cooperation on the C02 issue" (Glantz, 1988, p. 47). The last viewpoint appears to be correct. The issue, as a whole, is awesome, and there are no reasons whatsoever to hesitate or postpone an internationally regulated response to climate change. The strengthening of international cooperation, by its very nature, does not hinder the intensification of national and international research, the results of which should be accessible to all cooperating parties. A tiny example of a national attempt, in this respect, made ad hoc, is presented below. Comprehensive changes which occur in the entire flow of organic matter and energy through oceanic food webs, as a result of rising air temperature, cannot be estimated. Some processes are poorly understood and, therefore, are not reliably quantifiable. On the basis of existing data, one could crudely assess the changes in one parameter, that is, primary production, assuming that the air temperature would increase by 2.5°C on average and by 7°C in the polar regions. This kind of rough assessment was carried out especially for this chapter by Dr. B. Wozniak, oceanologist. Data collected from 1,000 monitoring stations were processed and analyzed. They include, among others, the following: underwater irradiance, temperature in the euphotic zone, and content of organic and inorganic nitrogen. Phosphorus was ignored so as not to complicate the matter, as well as due to the lack of data. Two forecasting models were applied in the course of this assessment. The first one relates to changes in primary production caused by temperature only. The second one, apart from the increase in temperature, allows for a simultaneous reduction of the content of total nitrogen. The outcomes of the computations have been produced in the form of tables and diagrams. 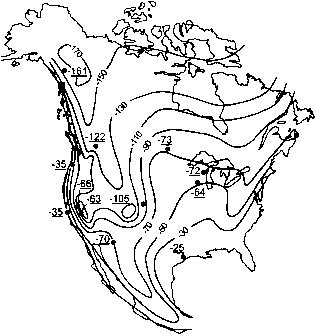 They distinguish the standard climatic zones used by oceanologists. In each zone three types of areas have been singled out: eutrophic, mezotrophic, and oligotrophic. The smallest change ranging from zero to minus 10 percent in primary production would be expected in the equatorial zone (from 10°N to 10°S), if the single factor model (temperature) turns out to be credible. If both models which allow for changes in the temperature and total nitrogen content are used, a reduction of primary production ranging from 5 to 21 percent in the eutrophic areas of the equatorial zone could be expected. Consequently, in oligotrophic areas of the equatorial zone, a reduction from 0 to 23 percent could likely occur. In the sub-Antarctic zone, on latitudes from 40° to 50°S, which is mostly oligotrophic, the increment of primary production could amount from 6 to 12 percent or 6 to 18 percent, respectively, depending on the model. The biggest growth of primary production could be envisaged between latitudes from 50° to 70°N and from 60° to 70°S. The models are far from accurate, and some reservation regarding the very concept might also be expressed. Nevertheless, for the purposes of an exercise, we wish to submit the results of computations related to the two selected areas, out of a total number of 10 with which the Polish distant-water fishery is concerned. 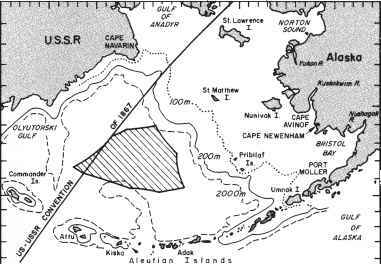 The first area constitutes a part of the Bering Sea shown on the map of Fig. 13.15. The second area stretches around the Falkland Islands (Malvinas). 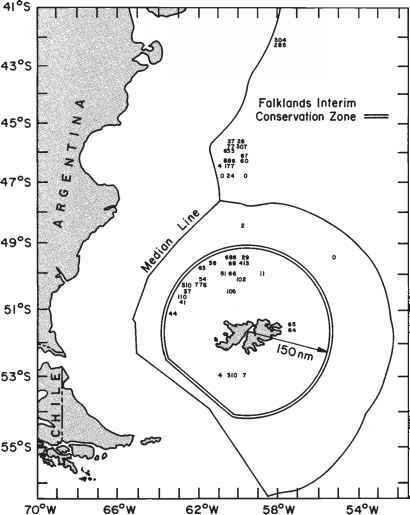 Figure 13.16 points to the British Zone, to the median line dividing the Falklands from Argentinian waters, the zone claimed by Argentina in order to incorporate the Falklands into its territory, and in addition presents the UK-Falkland interim conservation zone, which is explicitly defined and well monitored. The outcomes of the exercises, completed with the use of both models for the two areas, are shown in Table 13.6. Fig. 13.15 Fishing grounds exploited by Polish distant-water vessels, Bering Sea. not perfect in regions of very small or very high concentrations of nitrogen (below 0.3 and above 3 mg/liter). The models could not include other factors of a local character that influence primary production - factors which are often inextricable. Furthermore, one may also object that the assessment of primary production is not the same as the estimates of biomass of the secondary or tertiary carnivores that the fishery administrator would like to have on his desk for an easy decision in defining the total allowable catch. It really is not an assessment of biomass of a target fish we want to catch, but only a small step forward in constructing a general picture of what may occur in the future in the marine environment. It should be mentioned that similar computations carried out for some other regions in low latitudes are rather disappointing; the overall picture is far from optimistic. Based on this first, provisional, crude assessment of the primary production of the world's oceans, one would be inclined to assert that nobody will gain from global warming.